Just before Christmas was our group show, SHIFT, at ECCI (Edinburgh Centre for Carbon Innovation). The work was very much about tackling issues around climate change. My piece, titled ‘The Way’, attempted to demonstrate the shift necessary in our perceptions regarding the ways we live and climate change. The disrupted text requires the viewer to slow down their natural reading pace, and with the text being hand-drawn I hoped that would suggest that the changes needed are worth our time and effort. Before SHIFT we had a short exhibition in Tent, the Art, Space & Nature gallery at ECA. Umwelt was a group show based on our initial response to the fieldtrip we took in October to Lewis & Harris. The island landscape wasn’t quite the same as Shetland but certainly reminded me of home in some ways. I found myself particularly drawn to the area of Tolsta on the North East coast of Lewis. I spent a bit of time around the remains of a croft house and the small hill just behind it which was carpeted with withering bracken and heather. If you’ve read my blog before then you’re probably familiar with me mentioning intuition in my creative process and life in general. I felt pretty connected to this place and like I was being led. My first ideas were of creating sacred space, a place to step into and feel grounded, reminded of the interconnection of all and everything. I had begun weaving some samples with wool yarn from Shetland and the Outer Hebrides, testing bits of heather and bracken either woven in or stitched. 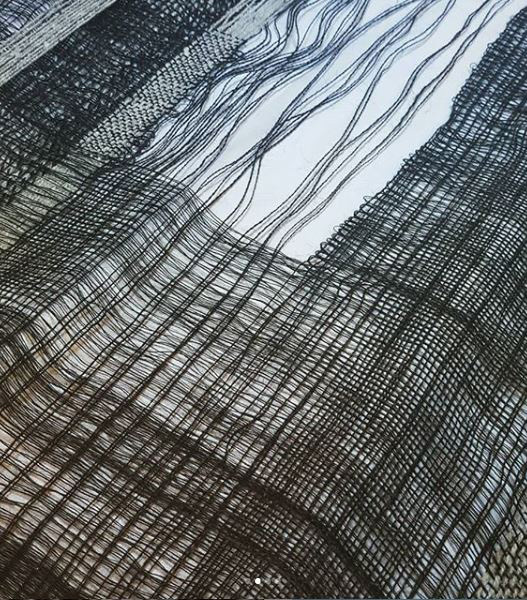 Considering layers of time, past and present, along with wanting to convey an ethereal or unseen presence or atmosphere led me to experiment with double-weave. 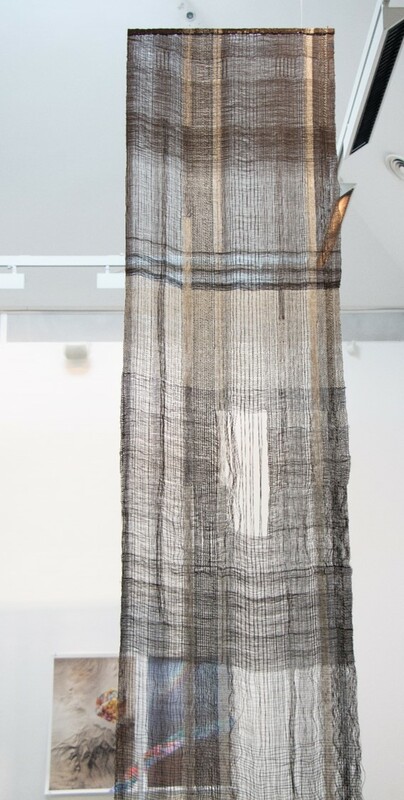 In the New Year I concentrated on weave to develop the final piece for our group show, Testimony from the Rocks, shown at An Lanntair, Stornoway, Isle of Lewis. I wanted to share the sense of presence I felt while in Lewis & Harris. A familiar presence that reminded me of being in the hill at home in Shetland. Recognition of shared ancestral experience. Most recently we’ve just completed a film project and taken part in the ECA Bookmarks artist’s book fair. I’ll get back with another post about these and our new project very soon.